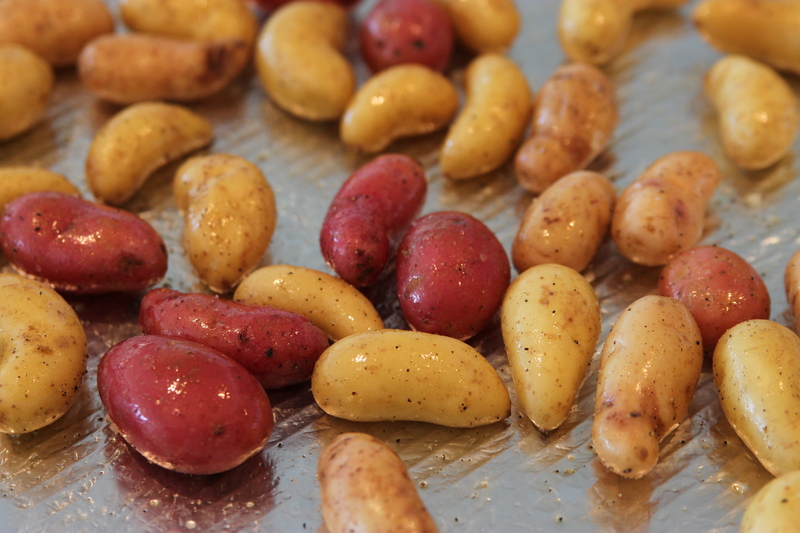 A mix of fingerlings will work best. You don’t have to cut them and they will add different flavors and textures to the salad. Mine was a mix of four heritage cultivars from my favorite farmer at the farmers market. Here are the young shallots–you can use both the bulbs and the tops. The bulbs are more mild than conventional shallots and the tops are peppery. If you don’t have access to young shallots, use one conventional shallot and some chives. Use plenty of dill, and good dijon mustard is a must! Add the dressing first so that the potatoes soak it up. Then add the herbs. Serve warm with a glass of very cold white wine. A bottle of Rosé makes this warm salad even better. 1) Heat oven to 400 F. Wash and dry potatoes. 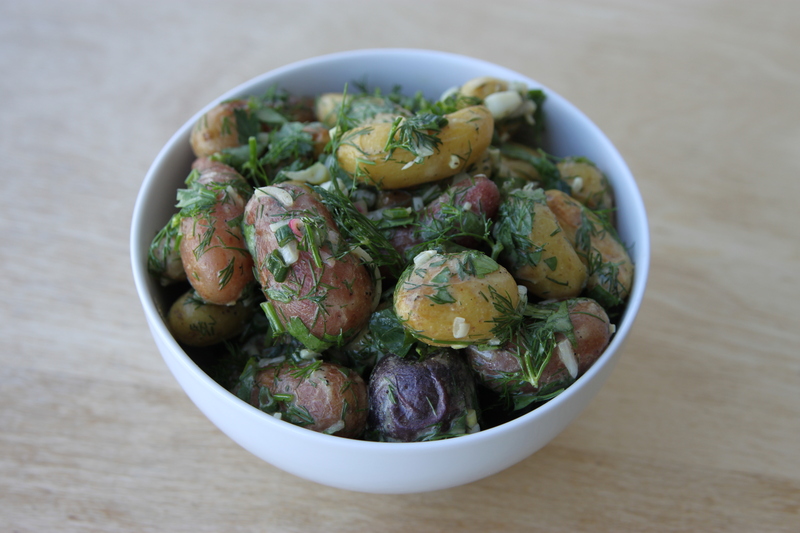 Place potatoes in a mixing bowl and top with 2 Tbsp. olive oil along with a healthy dose of sea salt and fresh ground pepper. Toss to mix well so that potatoes are shiny. Place potatoes on two aluminum foil lined baking sheets in an even manner. Bake for 20-25 minutes–until insides are soft and the skins have a slight crisp to them. Stir the potatoes once or twice while baking to prevent sticking. 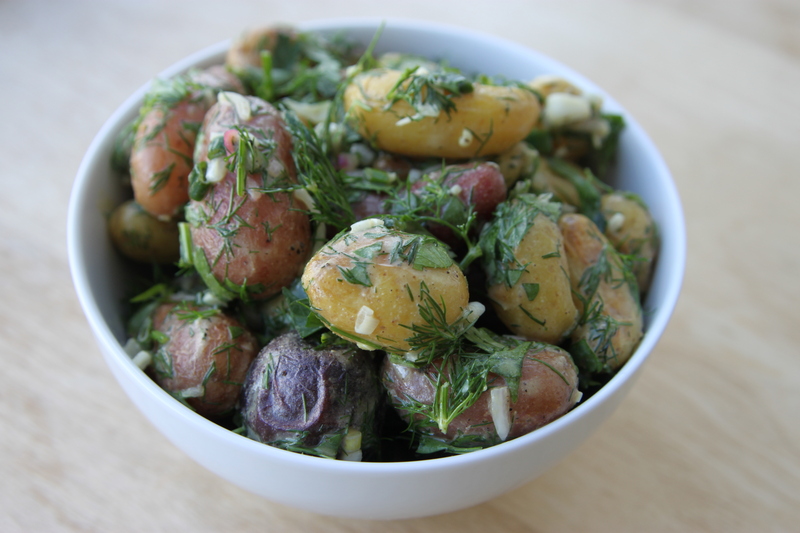 2) While the potatoes are cooking, wash and dry dill, parsley and young shallots. Roughly chop dill and parsley and place to the side. 3) In a large measuring cup, add juice of three lemons. Add 3 Tbsp. of high quality dijon mustard to the lemon juice and stir. Add 1 Tbsp. olive oil and stir to mix well. A fork works best. 4) Remove the green tops of the young shallots and the outer skin of the bulb. Then, mince young shallot bulbs and add to the lemon and dijon mixture. Stir well so that minced shallots are incorporated and the liquid is uniform in nature. 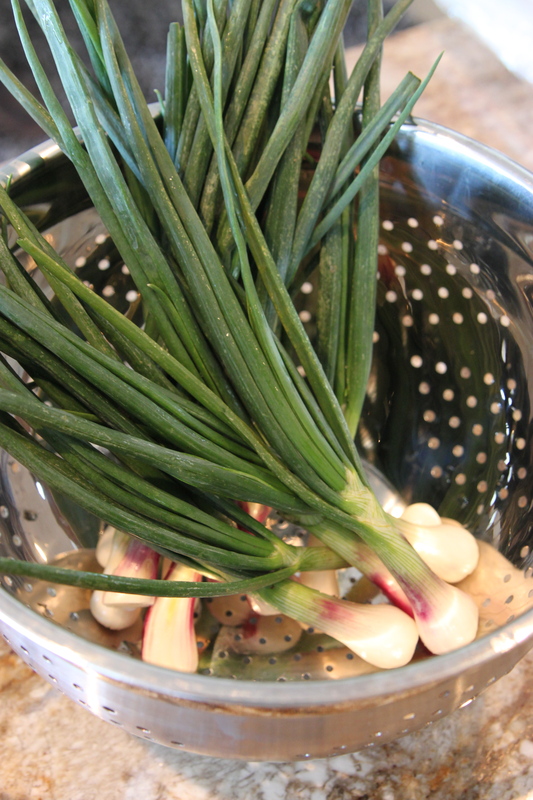 5) Chop the green tops of the young shallots as you would chives or green onions. Add to the chopped dill and parsley mix. 6) As soon as the potatoes are finished baking, let rest for one minute then place them in a large serving bowl and top with the lemon dijon dressing. Toss so that dressing is mixed in and all potatoes are covered. 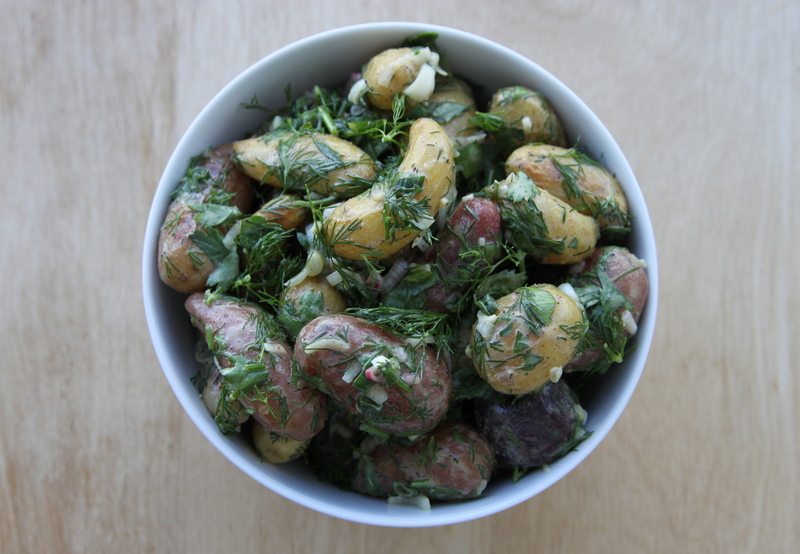 Then, top the potatoes with the chopped herbs and toss. Mix well. 7) Serve warm with fresh ground pepper to top. ***** If making extra, the salad is great served cold and will last for four days.